Instead of watching the super bowl, I hiked to the waterfall on Hickory Branch today, near the historic Curtis Creek area in the Pisgah National Forest. It was a beautiful winter day, and not only would I rather do just about anything but watch football, there’s not much I’d rather do than hike to a waterfall I’ve never seen before! The Curtis Creek area, in the shadow of Mount Mitchell and the Blue Ridge, was one of the first areas to be added to the National Forest after the creation of Pisgah. The hike starts at the Curtis Creek campground, which has just received major renovations and more campsites in the last few years. There are several trails in the area. The Hickory Branch trail goes past a waterfall, of course, but the others climb into the higher elevations and eventually lead all the way up to the Blue Ridge Parkway. The big winter storm of last Friday dumped record amounts of snow on the mid-atlantic states but didn’t do much in the Asheville area. However, it left this valley blanketed in about 6 inches of the white stuff. The higher elevation ridges, visible through the trees and from the open areas near the campground, were glittering a brilliant, silvery white with the remains of the damaging ice storm – nature’s pruning shears – that they received just a couple of days ago. The gate at the campground was closed, but it’s only a short walk from there up to the trailhead anyway. There were no tracks on the trail, so Darla and I forged ahead into fresh snow territory. The going was a bit tough – the snow was a lot deeper than I thought it would be – but it actually provides good traction on some of the really steep parts of the trail. Better than mud would, anyway. It was quite a sight – the woods were hush, except for the sound of rushing water. The streams are all higher than normal this winter, making it a good time to go out and see waterfalls. The trail climbs a bit more steeply at the very beginning and again near the falls, but overall it’s not that difficult. And it’s a short hike of less than a mile one-way. While not a magnificent or spectacular falls, this one definitely has its charm. I don’t know that I’d recommend making a special trip out here to see it, but if you are already in the area or camping at Curtis Creek, it’s definitely worthwhile. And if you’re looking for solitude after a snowstorm, apparently there’s no better place! 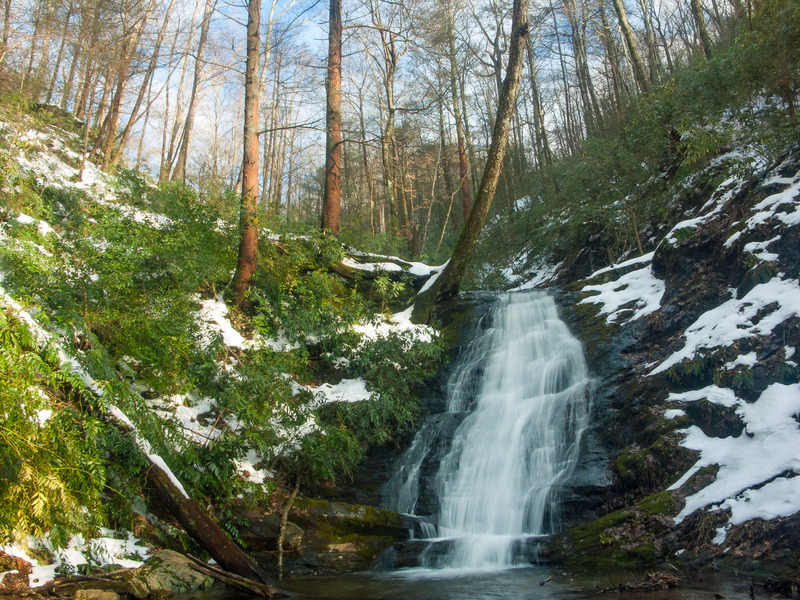 Get all the details on how to get to the falls on WNCWaterfalls.info!